Sourdough brownies: does cocoa powder matter? I can’t believe I’m down to about five weeks here until the school year comes to an end. I’m on my last lab of the sophomore curriculum – plated desserts – and I’ve got six more days of getting up at 5:15 in the morning. It’s been an adventure for sure, and it took a village to get to this point, as most of you know. All of it was so worth it though; what an experience I’ve had living in a completely different part of the country and going to my dream school! Sourdough starter is a combination of flour, water, and wild yeast that ferments for at least ten days, but can last for several years. Most people use it to make sourdough bread, but it can also be incorporated into hundreds of other recipes. Armed with google and sourdough starter, we set out to make brownies. We used a great sourdough brownie recipe (http://www.wildyeastblog.com/sourdough-brownies/) and made it twice – once with the dutch-process cocoa, and once with the black cocoa. The results were interesting, and very different from each other. Perhaps the most noticeable difference between the two was the color of the batter. The batter made with the black cocoa was indeed, well, black. 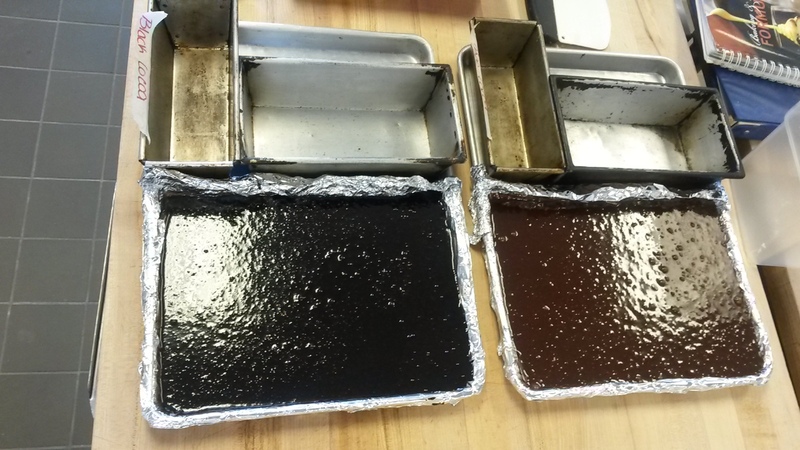 Most of the class said that the black batter looked unappealing, since it wasn’t even really a dark brown. I personally just couldn’t wait to try the “blackies,” as we called them, because I was waiting for an intense dark chocolate flavor. The baking times were slightly different. The brownies made with the dutch cocoa took a few minutes longer than the black cocoa brownies, and this could’ve been because the darker brownies absorbed heat more quickly, causing them to bake faster. The color difference is still quite obvious after baking. The smell was a little different as well: the dutch cocoa brownies had a cocoa sent, but we could easily pick up the sourdough aroma as well. 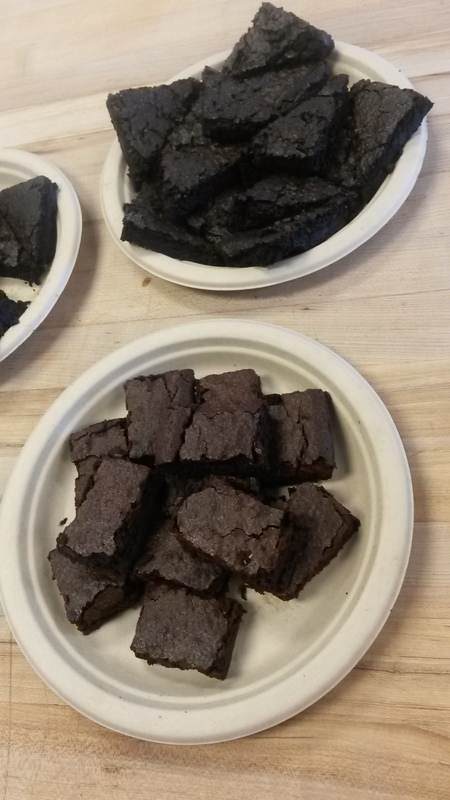 With the black cocoa brownies, the chocolate scent was much more pungent and the sourdough was barely noticeable. The wait for them to cool was a long one, but eventually, the tasting commenced. 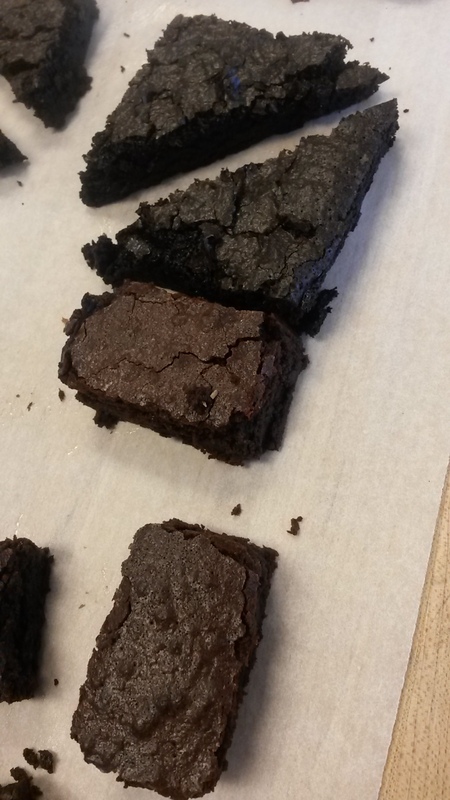 First, we tried the dutch cocoa sourdough brownies. The consistency was what you would come to expect from a brownie – a combination of a crumbly top and slightly fudgy center. Upon the first bite, it tasted like an ordinary brownie. As we chewed though, we tasted the unmistakable sourdough flavor. The starter gave the brownie almost an acidic flavor, but one that paired well with the cocoa. I also felt that the starter added a richness to the brownie – almost how sour cream can add moisture and richness to a chocolate cake. The black cocoa brownies were a different type of brownie entirely. They were extremely rich and decadent, and a bit more dense than the brownies made from the dutch-process cocoa. I preferred the black cocoa brownies, because although the sourdough starter was there, it could hardly be tasted under the bitterness of the cocoa. While still people said the color was a turn-off, I liked the black-velvet look of the brownies. Throw some chocolate ganache on there, and it’s the perfect “death by chocolate” sort of dessert. This little experiment definitely livened up an otherwise monotonous day, and it was a lesson to remember. As the school year draws to a close, I look forward to taking my formula book home with me and recreating most of everything I’ve learned during this incredible year. On the sweet side, indeed. The year’s half over, let’s stay for another!